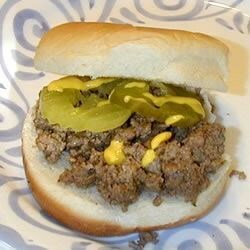 "These are my wife's version of the famous loose meat sandwiches. They are pretty tasty and very easy to make." In a large skillet over medium heat, cook the ground beef until brown. Drain. Return to pan with salt, pepper, and water to cover. Reduce heat to low and simmer, uncovered, until water is gone, 15 to 30 minutes. Serve meat on buns topped with chopped onion, dill pickle slices and mustard. See how to make tender Italian beef sandwiches with au jus.